Update: A new tree has been put in place. A City of Beaufort crew removed the diseased and dying cypress tree from Freedom Park on Bay Street – the city's unofficial "Christmas tree" — on Monday and will replace it next fall with a different species. "We removed the tree and our next steps will be to treat the soil and prep the area for replanting a new tree later in the year," said Isiah Smalls, public works director for the City of Beaufort. "During the interim, we'll make Freedom Park as aesthetically pleasing as possible. It was unfortunate the tree had to be removed, but based on its condition and eminent demise, we had no choice." The canker disease is a fungus that forms on the branches and twigs of the tree, causing foliage above the canker to die. Affected branches turn yellowish first and later turn brown or reddish brown. Last winter, City crews applied green paint to the tree to make it look healthier during the winter holidays, knowing they'd be removing the tree this spring, Smalls said. 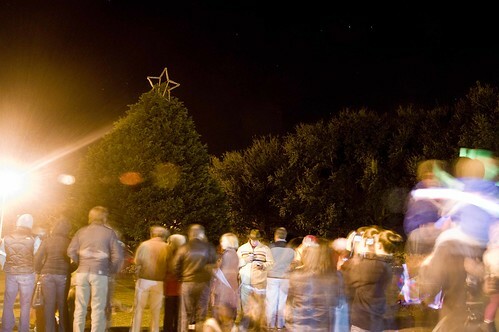 We'll part ways with out old friend by sharing a photo of the tree during the 2010 Night on the Town.